I love owls, I love drawing them and painting them. Although I haven’t done any lately my love was rekindled last week when I discovered a blog with the most amazing whimsical owls ever, very inspiring. When I saw that the prompt for Illustration Friday was ‘wild’, I couldn’t help myself. Also I had to do a drawing for my book. Here is Barnaby with the key to the Wise Man’s secret library. I had some other drawings in black ink and decided to test drive some inks I brought well over a year ago, lol! They are Sennelier – shellac based ink that is very transparent. Oh, I love, love them. You can’t see it in the scan but the finish is like satin. So thank you to Juliette for reminding me of how lovely owls are. Here is one of her whimsy owls, she also does courses on how to paint and draw whimsy. Isn’t it gorgeous! Linking to Sunday Sketches and Illustration Friday. Great sketch! So much depth and mystery to this little guy. I just love birds, not exactly sure what it is about them but they fascinate me. cute owls, and so is Juliette's. I also love owls - it's been a very owly week actually as Laurie sent me two of her wonderful owl prints in the post. Your drawing is fantastic and I love your painting as well - the colours are amazing. Juliettes whimsical owls are beautiful - I must visit her blog (i love discovering new folk this way!) 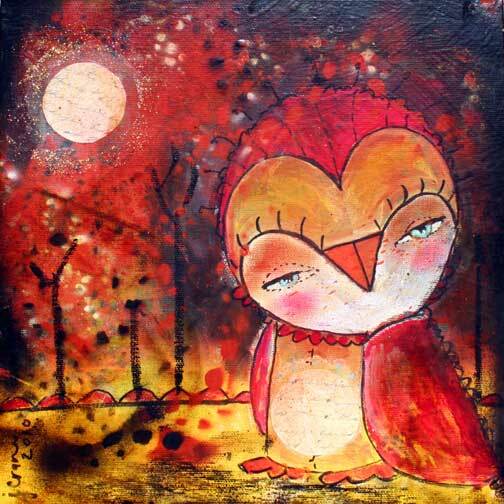 if you haven't already you should visit Nordljus's website - she did some gorgeous whimsical owls this week too! I love your owls - I think there is something so haunting about their eyes + Juliette's owls are so inspiring - a good choice! Really neat owl drawing! The inked ones are awesome with all the textures! Love all the owls! The inked one is amazing! They look wise, lovable and imperial simultaneously! The whimsical owl by Juliette looks cute, expressive...will be off to her blog now! You are good at owls and also good with different styles. What a talented lady you are! I love the vibrancy of your inky owls and their wonderful characterful faces. I love owls too. I have a falconry experience coming up soon, so can't wait - all sorts of birds of prey will be there. Your illustrations are wonderful - incredible detail. Holy smokes, your owl is gorgeous!! such great owls! love the transparency of the inks, just fantastic. Love how the one head goes out and the other goes in, but they both have a what are you looking at expression! Love the sketch too! Your owls are outstanding! The line work is phenomenal! I love the one with colors.........I bet it is wonderful in person! Barnaby looks wonderful. The colored ones are also great.Love the details on them.